Mozart Cadenzas: Try Something New! August 31, 2015, 11:42 AM · A few years ago, one of my students learned the Joachim cadenzas while learning Mozart Concerto No. 5. They were a good challenge, and I consider them to be classic. Beside that, I'm pretty comfy with those old Joseph Joachim cadenzas. Comfy playing them, comfy teaching them. They are the cadenzas I learned as a child, and they are some of the most commonly-used cadenzas for those works. But I've decided it's time to step out of the comfort zone. Now she is studying another Mozart concerto, No. 4, and I thought, why not try something new? Frankly there are a lot of other cadenzas out there for Mozart 4. To name a few: in the Barenreiter edition we're using, we have Joachim and also Leopold Auer, plus the editor Martin Wulfhorst. With some digging on the Internet and elsewhere, one can also find cadenzas by Eduard Herrmann, Sam Franko, Fritz Kreisler, Ferdinand David, Henri Marteau, Emile Sauret, Nathan Milstein, and Jascha Heifetz. To get a little more modern, there is Robert Levin, plus performers such as Maxim Vengerov, Nigel Kennedy, James Ehnes and Augustin Hadelich. Have any women written cadenzas for the Mozart violin concertos? The only one I could find was Rachel Barton Pine, and actually, this was the one for which I have the music, because Rachel has made all her cadenzas (for the Mozart concertos, Berg, Brahms, Clement, Beethoven, Paganini...) readily available in her The Rachel Barton Pine Collection. I took a look, and it seemed pretty do-able. "How about learning a cadenza by a female musician, one who is actually alive today?" I asked my student. She liked the idea, and over the summer, she started learning it. One more thing that makes Rachel's cadenzas accessible is the fact that she played them in her recent recording of all the Mozart violin concertos. A student can listen to the cadenza, played by the very artist who wrote it! It's going to be a challenge, not just for my student, but for me, to learn new cadenzas at the same time as she does. But I certainly like the idea; I think it brings these pieces alive, to use a cadenza by a living performer. I'd love it if cadenzas written by other current performers were as easily accessible. September 1, 2015 at 01:39 AM · How does Pine's Mozart 5 cadenza compare in difficult to the Joachim? September 1, 2015 at 02:42 AM · Some modern performers may be going back to the "original" idea that one improvises one's cadenza as one performs it. That's certainly what Leonard Elschenbroich told me he did when I asked him, awestruck at the musical quality of his cadenza to the Haydn (The NOTES didn't sound difficult - but the control and musicality needed to make music out of them was, I think, more difficult than technical fireworks would have been). THAT reply left me speechless! If that's what HE does, you can bet your bottom dollar that if Nicola Benedetti is playing her own cadenza it will either be improvised or, if she's not quite up to that (It's asking a bit much for both of them to display that kind of genius), composed with help from Leonard. September 1, 2015 at 04:24 AM · I really love the Franco Gulli cadenzas for Mozart A Major- they're a little hard to find though. 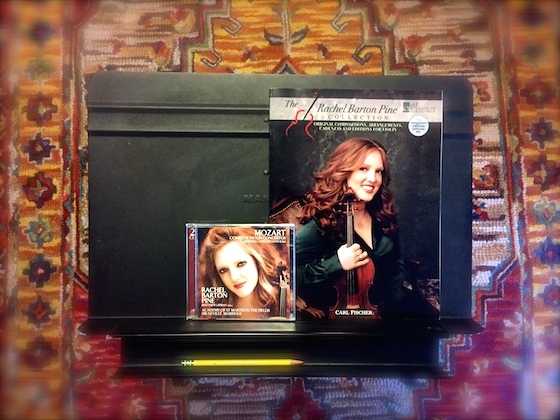 September 1, 2015 at 02:55 PM · Rachel Barton Pine was actually my inspiration to start playing violin, and I would totally play her cadenzas! Maybe some day I'll get around to writing my own, too. September 1, 2015 at 04:09 PM · To answer Paul's question, I would say the level is comparable to Joachim's cadenza, but the issues are different. Focusing on the first movement of Mozart 4 (because that's what I'm doing right now with my student), Rachel's cadenza has a lot of large, blind leaps to higher positions. At the beginning, there are also some double stops in high positions, for example, fifths, which are a bit harder for the fingers to block way high, where the strings are higher off the fingerboard and farther apart. Like the Joachim, it has some bariolage. It doesn't have as much double-stop polyphony, so it's easier that way. But it also has a few licks that are just way way high. The other movements, frankly, look easier. Joachim's second-movement cadenza is quite virtuosic (I daresay a little out of character from the Mozart, but we can argue about that! :) It has quite a lot of rather complicated double=stops. Rachel's follows the more chill-nature of that movement. In both cases, the third-movement cadenzas are pretty brief. September 1, 2015 at 06:31 PM · Gilles Apap, right, Bram? People tend to have wildly differing reactions to that one. On one hand, cool! It's something just so different and surprising and out of the box. We need to shake things up a bit in our classical world. On the other hand, though, it goes so far afield that it doesn't really relate to the Mozart, even if it does maybe "relate" to the audience. Seems like there must be a middle ground, where one brings the idea of different genres in, but still somehow incorporates the melodic fragments and ideas from the concerto. I'm glad you posted that, though! September 6, 2015 at 01:07 PM · Monica Huggett made her own cadenzas for her 1994 Mozart Concerto set with the Orchestra of the Age of Enlightenment, performing on period instrument on the Virgin Veritas label (I saw recently these on Amazon for under a dollar). These are a favorite set of mine; the interpretations are exquisite, in my opinion -- but then again, I studied with her, so I a bit biased.